The new products will officially be available on the MFT online store on February 6th at 9:00 pm EST (= Europe: February 7th at 3:00 am CET). 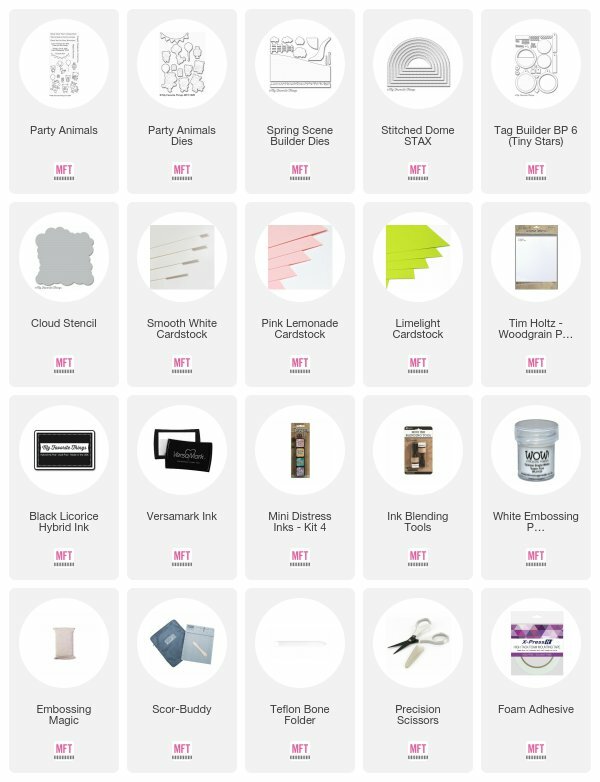 Most of the supplies I used for this project are linked at the bottom of this post. This cow is so sweet. Totally in love with this image and stamp set. I went for a little birthday scene. I created the clouds using the Cloud stencil that I sponged with Distress inks. The grassy border is from the Spring Scene Builder die set and I die cut it from Limelight cardstock. For the front panel, I used white woodgrain paper. It shows such a great texture. The opening was die cut using the Stitched Dome STAX Die-namics. The sentiment is from the Party Animals set. It was heat embossed with white embossing powder on Pink Lemonade cardstock. I used the Tag Builder Blueprints 6 Die-namics set to die cut the tiny stars I glued on top of the banner. Wouaw ! J'adore ta carte ! Les couleurs sont magnifiques et tes dégradés.... Le ballon a particulièrement attiré mon attention mais seulement après que j'aie complètement craqué sur le petit cochon, Il est vraiment trop chou, et la vache qui est totalement hilarante !!!! Une fois encore, tu as créé une véritable chef d'œuvre ! 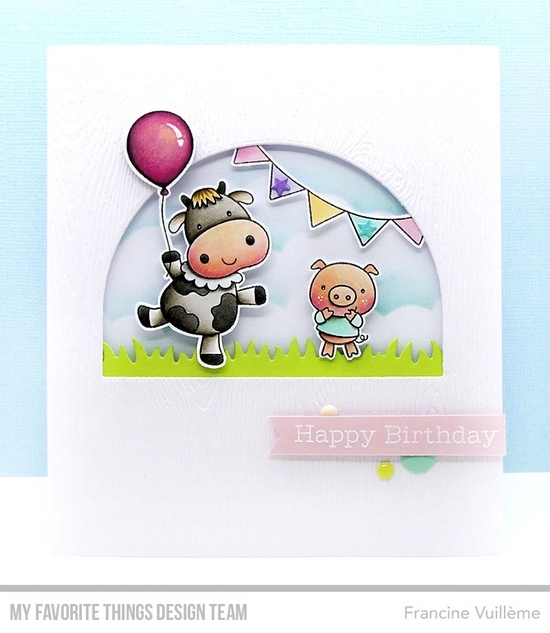 Really moo- tiful card you've made, the cow is a really cute little image. Love your cards soft colours. Such a darling stamp set! Love your card! Wonderful party animals in a dome! This is adorable! I love the colors that you used. That’s an adorable and fun card ! Another really cute birthday card, Francine! Your Copic coloring really brings these adorable images to life!!! This is so sweet - love your soft colors. Such a cute card! I love your coloring and the scene you created is adorable! Adorable birthday card!Love the color combo!